Amybeads: Therese's Treasures Birthday Challenge 2 • Reveal! 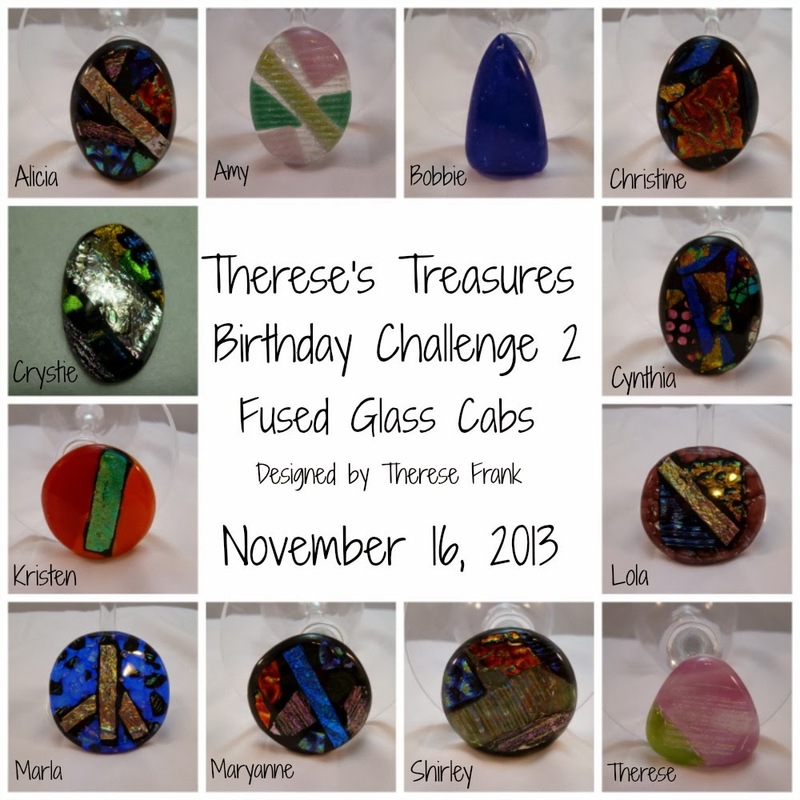 Therese's Treasures Birthday Challenge 2 • Reveal! 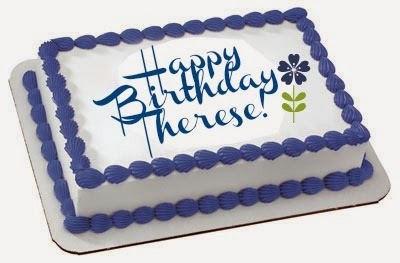 It's that time of year again - Therese's birthday!!! Whoop whoop - RAISE THE ROOF! To review, last year Therese of Therese's Treasures, surprised a group of us bloggers with some gorgeous Golem cabs with coordinating beads. Her wish was for us to create something with them and reveal our creation on her birthday. This year - she surprised us even further by sending us cabs that she created herself! She learned glass fusing this past year and created a whole bunch of gorgeous cabs. Here are all the fused glass cabs she created! I am humbled by Therese's generosity and so pleased to be included in her challenge again. I was delighted to receive my package from Therese. Right away I knew I wanted to bezel this pretty piece. I pulled some pale transparent green seed beads that matched the middle stripe perfectly and used a silvery thread to create a RAW bezel. I was surprised at how thick this cab actually was! But after several RAW rows, the bezel fit nice & snug over the cab. The cab turned out very uniform, so for the necklace I really wanted to reflect the asymmetry in the cab with the straps of the necklace. So I did a partial cellini spiral with all the colors of the cab: pink, seafoam green, pale green, and silver. The rest was done light green pearls. I rummaged through my clasp drawer and was delighted to see this toggle. I thought it was really redolent of the bezel! It was a pleasure to be part of this challenge again. I enjoyed the process so very much, and the final result. Yesterday at the last minute I decided to make some earrings to match. 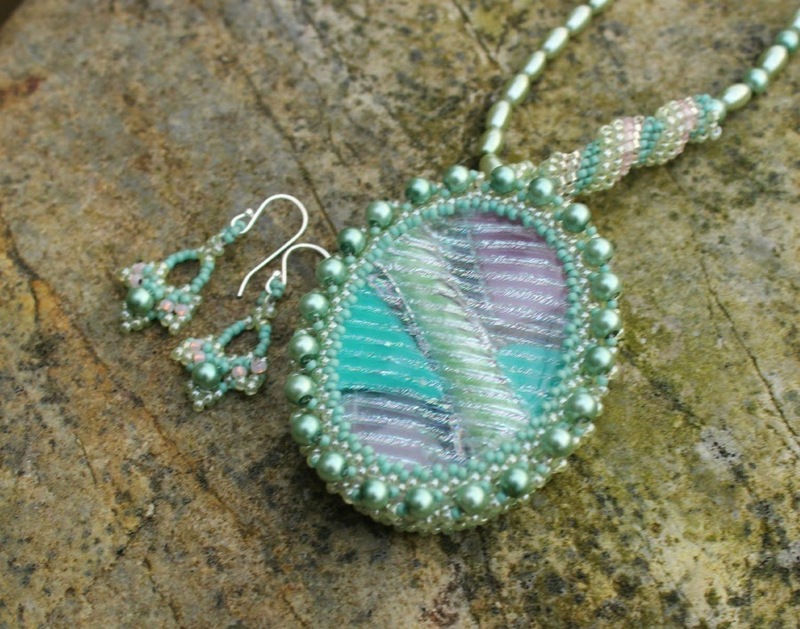 Earlier this week, I treated myself to Cynthia Newcomer Daniel's Seed Bead Earrings Tiny Treasures Tutorial. 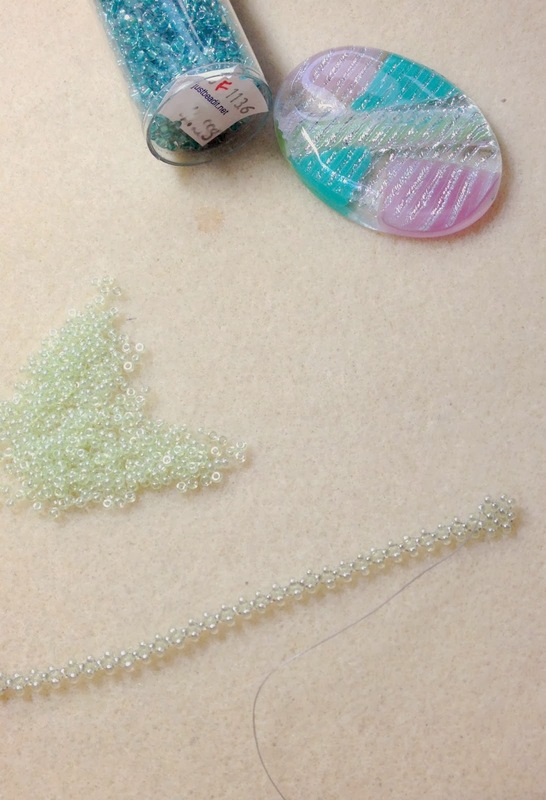 I admit this was a rush job on the earrings(trying to get them done before the sun went down! ), but even still I'm pretty happy with them and I can't wait to make more of them. They work up so fast!! More on them later when I make a few more pairs! Here is a list of the other participants and friends! I can't wait to see what everyone else made! I love what you did with your cab, Amy! The colors are so soft and beautiful and I love the necklace, combining the strung pearls with the cellini. Sooo cool. Have a good weekend. I hope all is going well at work! Amy!!!! Love that cellini traveling up the rope, what a genius you are! Bezeling that beauty was definitely the right choice, it came out beautiful! Now I'm going to head over and check out Cynthia's tute, I've not seen that one. Totally cute earrings! Gorgeous Amy, I love what you did with your cab. When I was shaping this cab I knew then that I was going to give this one to you, because these are your colors, or at least when I see these colors I think of you. I almost purchased that earring tutorial the other day, they look so pretty with your necklace, great choice. Thank you so much for participating in my Birthday challenge and to help make this a wonderful 54th birthday. That came out so perfectly!!! Is this a piece you'll keep for yourself or sell/give away? The bezel on the cab is beautiful, and then, BAM! You wow us with the perfect touch of the asymmetrical spiral! 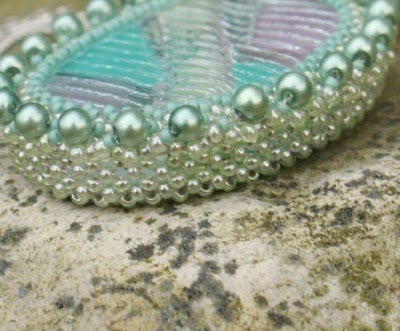 The colors are so delicate, and your choice of the freshwater pearls set them off really nicely. Great job! Amy, that's such a perfect job on the bezel and spiral - absolutely stunning! The pearls are matching the cab perfectly, and the whole piece is awesome. You complimented the cab perfectly and the whole necklace reminds me of candy. It is so sweet! And those earrings. . .SWOON! !